The Tenth Karmapa, Chöying Dorjé (1604-1674), head of the Karma Kagyu school, was not a professional artist, but in Debreczeny’s words “painting and sculpture was his passion (65).” Chöying Dorjé’s painting style was very different from “the mainstream Tibetan painting of his time (69),” which was dominated by the Menri style from the mid-fifteenth century. Menri is known for its predominance of blue and green palette, strict iconography and iconometry [artistic conventions for the proportions of buddhas, deities and so forth], and a symmetrical composition crowded with details that fill the canvas. Chöying Dorjé was trained in part by his religious teacher, the Sixth Shamar, as well as a master painter of the Menri tradition, but seems to have developed most as an artist through the viewing and copying of Buddhist art encountered in his wide-ranging travels. Chöying Dorjé was especially interested in archaic styles and the art of Tibet’s neighbors, developing a highly personal idiom that incorporated features from what Tibetans called “Kashmir” (northwest India), Nepal, and China and was unusually versatile in styles from the Tibetan Yarlung (7th – 8th century), Chinese Song and Yuan, and fifteenth century Tibetan master artists. He was especially fond of the Chinese theme of the Sixteen Arhats, and painted sets of the subject multiple times. The Tenth Karmapa, Chöying Dorjé, was most influenced by Chinese painting styles, genres and techniques during his twenty-five year exile from central Tibet, mostly spent in Lijiang, Yunnan. He was a close contemporary of the Fifth Dalai Lama, but experienced the other side of geopolitical struggles of the seventeenth century, barely escaping with his life when Gushri Khan invaded in 1642 and, in securing the Fifth Dalai Lama’s throne, persecuted the Kagyu. One the most engaging accounts from his life is described in the introductory chapters by Irmgard Mengele and Debreczeny, which detail the arduous solo journeys undertaken in disguise back into Tibet to find young Karma Kagyu reincarnations and bring them back to Lijiang for training, thus preserving the lineage. Chöying Dorjé’s “Chinese thangka painting” featured the Chinese conventions for the asymmetrical arrangement of figures, whose activities transpired in sparse, open landscapes. His “figural style is quite distinctive, especially in his fleshy elongated heads, featuring simple abbreviated faces with tiny, red, pursed lips (125).” His love of animals, especially birds, is mentioned in his biographies and animals appear in his paintings rendered with special sensitivity, naturalism and often playfulness. From the age of nine until the end of his life, he painted works based upon visions and dreams, and delighted in compositions of his own design. Despite his unique style, Chöying Dorjé’s mixture of styles and periods have made attribution of his works challenging. This task of the art historian is further compounded by the workshops of trained artists Chöying Dorjé employed. Debreczeny devotes several chapters to first a detailed analysis of the set of seven paintings securely dated to 1660 and inscribed by Chöying Dorjé as made “in their entirety by his own hand” (chapter 3). These then serve as an “anchor” against which other works may be compared, as Debreczeny does in the following three chapters regarding painting sets of the Sixteen Arhats (chapter 4) and Deeds of the Buddha (chapter 5), and in reevaluation of works previously attributed to Chöying Dorjé (chapter 6), and Ian Alsop takes up in regard to debate about sculptures (chapter 8). These chapters offer formal analysis, while also exploring the complicated cultural and religious questions of authorship, which can imply the artists’ own hand, his design, his workshop, or a style he initiated. What might be of most interest to the Buddhist scholar or practitioner is the sheer number of functions that Chöying Dorjé and his associates ascribed to or engaged in through the production and viewing of religious art; I counted at least two dozen. Chöying Dorjé examined art constantly, commenting on and differentiating between its religious power and aesthetic value; he copied paintings and drew statues as a means to training, and to put back into circulation through copies images he cared for. He created works for life cycle events such as ordinations, enthronements, deaths, and as gifts for the faithful to encourage their practice. He made paintings to outfit new temples, and to serve as objects for receiving the confession, prostrations, and offerings of devotees, i.e. for merit making. Chöying Dorjé also calls upon the efficacy of paintings of the divinities as witnesses to rituals, and to directly affect the environment in terminating illnesses, removing obstacles to long life, and even in subduing an army. 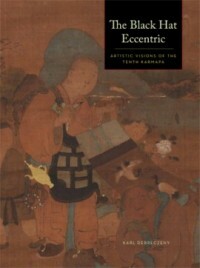 The Black Hat Eccentric is likely to become an indispensible reference: it is thoroughly annotated (with 893 endnotes), richly illustrated not only with works by and attributed to the Tenth Karmapa, but examples of art to which he was likely exposed and would have been of contemporaneous or historical interest to him. Thus the reader is offered a thorough art history, but most importantly and uniquely, from the perspective of a remarkable artist, so that we can immerse ourselves in his visual world, and be all the more amazed by his unprecedented vision. The publication was accompanied by “The Tenth Karmapa and Tibet’s Turbulent 17th Century Conference,” held November 9-11, 2012, at the Rubin Museum of Art, New York City. Leigh Sangster is completing a Ph.D. from the Institute of Liberal Arts at Emory University and is Director of Programs at Maitripa College, Portland, Oregon.